Bolt under hood to provide a tie-down attachment. Loops lock in place with the pressure providing a quick, easy tie-down attachment. Our Experts here hand select from all the best carrying systems for your Canoe or Kayak. So you know your getting the best from YAKIMA, THULE and OAK ORCHARD !!! We stock all the best accessories for these great rack systems! 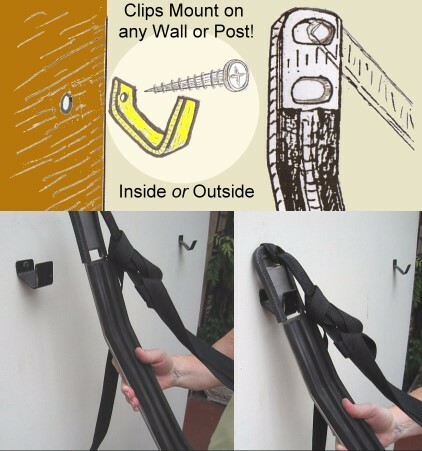 -Removes Easily To Use As Kayak Wall Storage w/ Clip Kit. Choose from 3 styles - Standard, SUV & Storage Only! 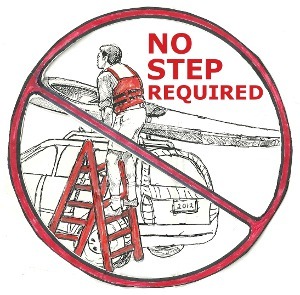 TIRED of STEP STOOL KAYAK LOADING? ...trying to reach your box store type kayak carriers on your tall SUV/MiniVan Factory installed crossbars? Difficult 30 minute two person kayak loading? Ladders-Step stools? Why Do We Carry Kayaks On Their Sides and Not Flat? 1. To carry more than one kayak on short cross bars. ie: Factory installed crossbars, compact cars. 2. The sides of kayaks are very strong - unlikely to dent. 3. 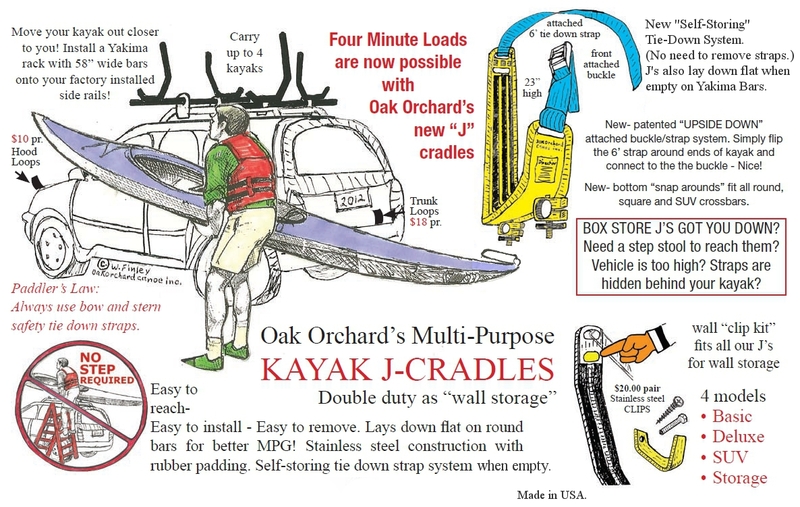 Only Oak Orchard's Multi-Purpose Stainless Steel J-Cradles carry kayaks, remove easily and double as kayak wall storage with optional Wall Clips. 4. Only Oak Orchard's Multi-Purpose Stainless Steel J-Cradles can lay down flat when empty on Yakima bars. 5. HD Stainless Steel, deluxe rubber padded, 23" high, so they aren't hidden behind your boat like competitors! All Weather Stainless Steel Frame (no rust), Deluxe Rubber Padding. Fits all kayaks. Each J-Cradle is 14" from front to rear, about 10" of this in the middle tray contacts the bar. Each Cradle is about 23" tall. Frequently the kayak takes up more space than the cradles. We use two bolts and two connectors per cradle or saddle for extra stability compared to other brands which only have one. Our two connectors are spaced apart so that you can span over a tower. If there is just one connector you need to go either side of the tower, which means you have less room for kayaks. The Only "J" Style Kayak Carrier able To Move From the Cartop to Kayak Storage on a Wall ...In Two Minutes! This design is much more effective than a mere stacker and it's tall enough to handle even the widest tandem kayaks -yet narrow kayaks are no problem. Other J's and stackers have many more parts to remove, are more difficult to take on and off and are usually only about 1/2 the height of our Stainless Steel J-Cradles. When empty both J-Cradles can be loosened and tilt over flat so you can easily reach straps or even drive into your garage! Includes two patented upside down - easy load - no step stool required - straps! a.) 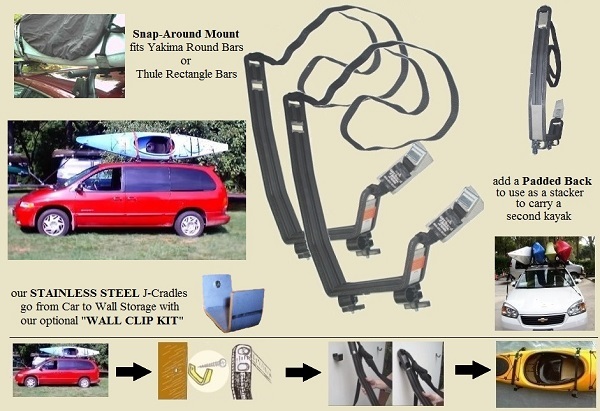 Use Stainless Steel J-Cradles for kayak wall storage with optional Wall Clip Kit. b.) Add padding on the back to use J-Cradle as a stacker to carry a second kayak. Always use bow and stern straps (sold separately). The Only "J" Style Kayak Carrier Able To Move From Your Car's Factory Rack To Kayak Storage on a Wall In 2 Minutes! The Universal Mount fits perfectly on any shape of rack crossbars; round, square, oval elliptical, and most rack crossbar shapes up to 3" wide or up to 2" thick including Yakima Jetstream bars and Core bars, Thule Aero bars, and most factory racks. Screws; the back of each cradle which is pre-drilled for 3 mounting screws (included) to mount directly to your wall, stud or post. One pair of our sturdy J-Cradles will hold your kayak secure on its side. Sold in PAIRS... which Includes 3 mounting screws and 1 adjustable strap with each padded cradle. "Stainless Steel Oak Orchard J-Cradles"
on a wall or post for convenient Kayak storage. Add $6.95 Shipping and Handling. This is the same clip that we use on our Free Standing Kayak Rack. Fits the Basic, Deluxe and Universal SUV/Minivan J-Cradles! With only two pieces to remove, you can have the J-Cradle off the car and onto the wall for storage in two minutes. The rod and round base extends 14" from wall empty and 16" with the J-Cradle installed. "Demonstrating the simplicity of transferring the J-cradle from the car to the garage wall!" No expensive wall racks or belts or pulleys necessary! The wall mount kit makes storage a breeze. This one carry system does it all. Now your J-Cradles can be used for storage AND cartopping ! And putting the J-Cradle back on the car takes less than 2 minutes! 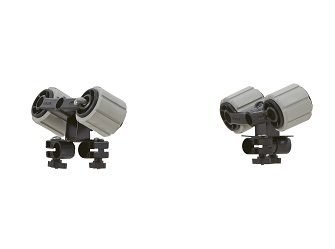 Mounts to any studded wall or wood post - screws included. 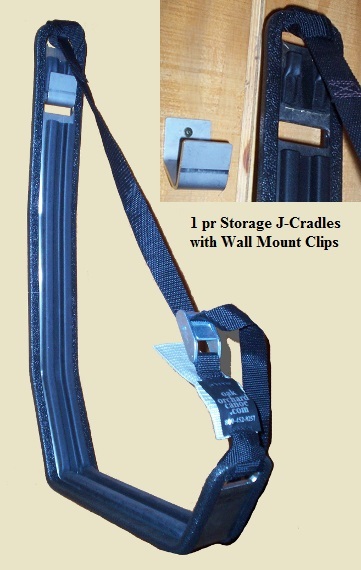 Shown here in action (below), J-Cradles with "wall mount kit"
Now you can use your J-Cradles for storage And car topping! 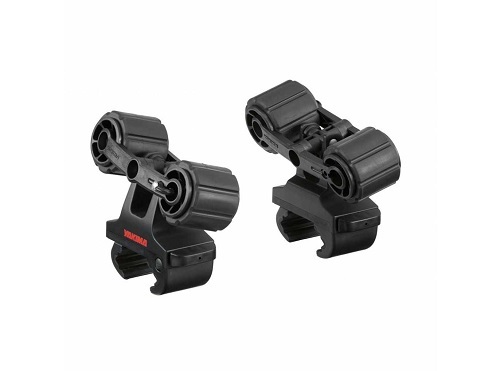 * the Wall Mount kit for "Thule users" includes an extra set of "Universal Snap Around" connectors. You will have one set to fit your rectangular Thule bars and another for the round 13" long wall mount bar. The latest from Oak Orchard! The new "Gull Wing" kayak saddle will outperform all others and our two models will fit 95% of all kayak hull shapes. Made of tough ABS plastic. Standard version fits Yakima round bar and Thule rectangular bar racks, Universal Model fits factory installed racks up to 3" wide or up to 2" thick, Yakima Jetstream bars and Core bars, and Thule Aero bars. Each Gull Wing's large Felt padded surface will allow you to SLIDE your kayak ON or OFF your rack. This makes kayak loading and un-loading so EASY. Gull Wing; 18" x 12" V shape (center is 3" lower than sides). Gull Wing XL; 22" x 12" V shape (center is 2" lower than sides). Gull Wing Caribbean; 21.5" x 12" V Shape (center is 2.5" lower than sides). Compare our 216 square inch surface area per saddle against competitors rollers and saddles of only 8 to 48 square inches. (XL is 264 square inches). Heavy Duty; MADE IN USA. Frequently the kayak takes up more space than the saddles, which are very form fitting. We use two bolts and two connectors per saddle or saddle for extra stability compared to other brands which only have one. Our two connectors are spaced apart so that you can span over a tower. If there is just one connector you need to go either side of the tower, which means you have less room for kayaks. Our standard Gull Wing's Semi "V" shape fits most 12' to 17' one person kayaks with sleeker hull shapes, or where crossbars are far apart. Huge 18" x 12" Felt padded surface makes for an easy rear load and won't dent hulls. Won't dent your kayak hull like the others. The new "Gull Wing" kayak carrier will outperform all others and fit 95% of all hull shapes. No other saddles have this much surface area to protect your kayak's hull shape against denting. Made of tough ABS plastic with a soft felt surface on top. 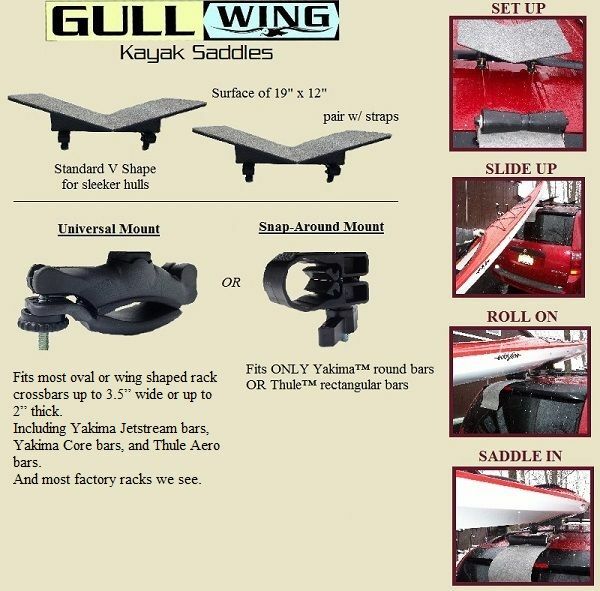 Gull Wings are the only saddles that allow you to load from the side of your vehicle OR you can slide your kayak forward when loading from the rear of the vehicle. Other brand saddles actually resist sliding the kayak forward and make loading more difficult. Perfect for Rec Sit-In or Sit-On type kayaks OR those being carried on smaller roof lines where the crossbars are very close together. Snap-Around Mount Fits ONLY Yakima round bars OR Thule rectangular bars. Universal Mount Fits most rack crossbar shapes up to 3" wide or up to 2" thick. Including Yakima Jetstream bars and Yakima Core bars, Thule Aero bars, and most factory racks. 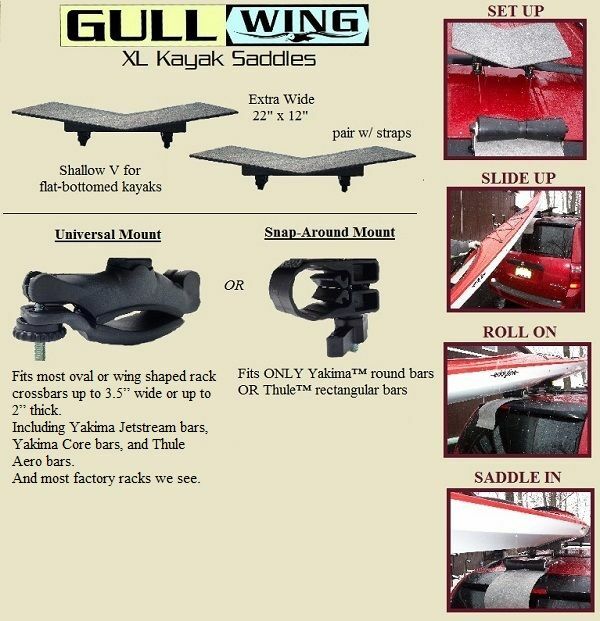 Gull wing XL saddles fit kayaks with a wider, flatter bottom; such as Old Town Vapor or Loon, Wilderness Systems Pamlico or Tarpon, Perception Prodigy, Native WaterCraft Marvel or Inuit and most tandems. Click here for Gull Wing and Gull Wing XL fit chart. Two 13ft over the hull tie-down straps are included but we also recommend four of our bow/stern straps (either 8ft or 6ft). The latest from Oak Orchard! 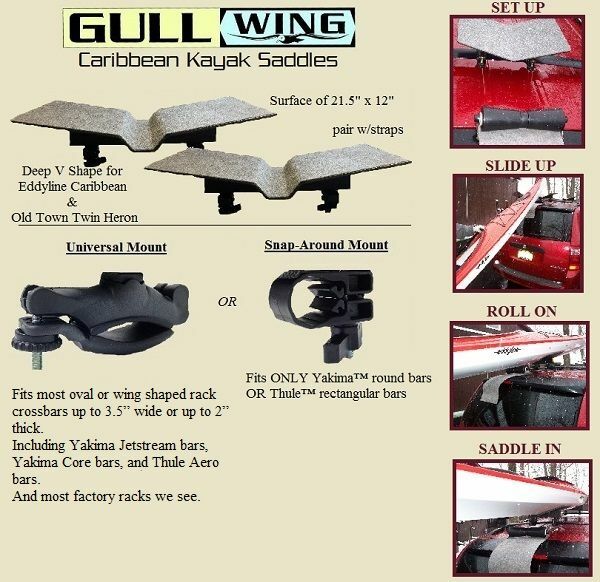 The new "Gull Wing" saddles for Eddyline's 12 or 14 ft Caribbean kayaks. Made of tough ABS plastic, felt padded. Gull Wing Caribbean saddles fit Eddyline's 12 or 14 ft Caribbean kayaks and Old Town's Twin Heron tandem kayak. Click here for Gull Wing and Gull Wing XL fit chart. Two 13ft over the hull tie-down straps are included but we also recommend a four of our bow/stern straps (either 8ft or 6ft). Reg. $220. SALE: $199.90 /pair. 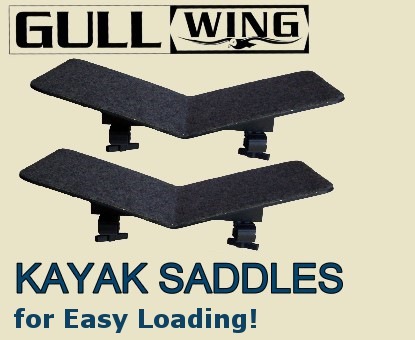 Click here for more details on our Gull Wing Kayak Saddles. doesn't get any easier than this"
Fits Yakima and Thule bars. 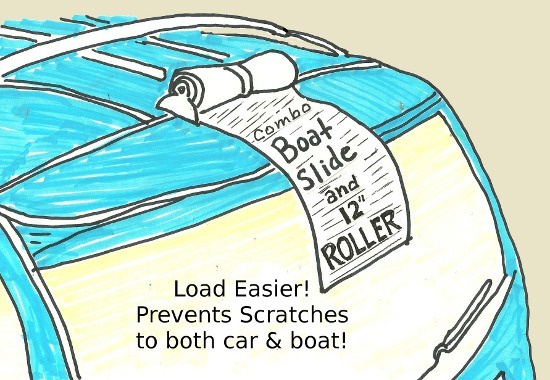 An excellent aid for those who load their kayak from the rear of their vehicle. "Loading and Unloading doesn't get any easier than this"
Fits round Yakima bars. 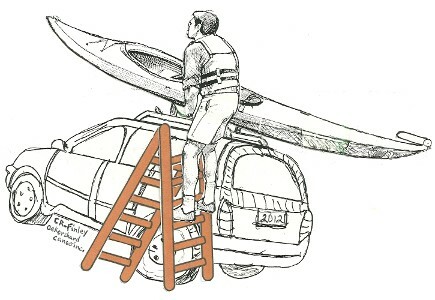 An excellent aid for those who load their kayak from the rear of their vehicle. At Oak Orchard we are always trying to improve the Kayaker's way of life! Our most recent innovation is our "Mini Roller". Now loading and unloading is easier with the Oak Orchard Mini Roller. Less work = more fun! The "Mini Roller" is particularly helpful if your kayak is a little heavy or if your Hullys need to be spaced farther apart. This device goes in-between Yakima's Hully Rollers or any other type of saddles you have on round Yakima bars. -Makes loading and unloading a snap!!! The dilemma many people have with Hully Rollers is if you place them far apart you'll have good hull contact and be less likely to dent the bottom of your kayak but that means loading is more difficult since the kayak can only slide on the crossbar. 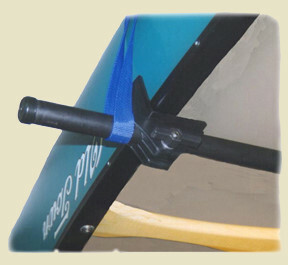 Mini Rollers improve the effectiveness of your Hully Rollers or other saddles by preventing your kayak from scraping accross the bar until the larger Hully Rollers can roll the hull. 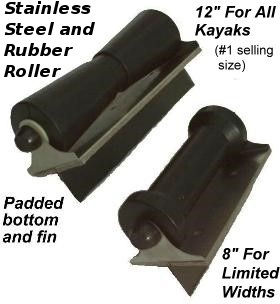 Now your kayak will be on rollers 100% of the time while loading or unloading when you use our Mini Roller! Our Mini Roller's special No-rust Stainless Steel frame and 5" rubber roller will work between any pair of kayak saddles or rollers. Mini Roller fits on the classic round Yakima cross bars. Made in USA. 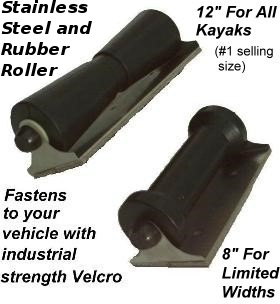 Oak Orchards Exclusive "SUV KAYAK ROLLER LOADER"
on to your SUV, Minivan or Car just got a lot easier! You'll go paddling more often if you make it Easy! 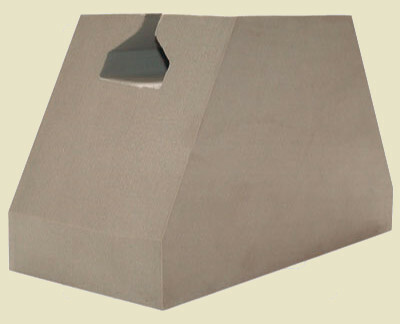 Our most popular model, the 12" Fin Model drops down into the 5th door crack in the roof. The fin requires a vertical space at least 1 1/2" deep to be firmly in place to load. Return it to the heavy duty storage box when your kayak is loaded. Do not attempt to lift rear door with roller in place. Do not attempt to drive with roller in place. The FIN style Roller with a bottom "fin" to simply drop into the "crack" in the roof where the rear door meets the roofline. (Fin depth is 1 1/2".) Works with most SUV, Minivans and Crossover type vehicles with a rear lift door. Note: our Fin Style roller includes felt shims for a snug fit. Prior to use you should install these on the "fin" as needed for a snug fit for your particular vehicle. Insert roller into rear door Gap Rear of roof, Roll your kayak forward onto the rack. Will it work on my car? Check your vertical depth and available straight line width. The "fin" of our 8" roller is 8" wide and 2" deep. The Roller Frame is nicely padded and 8" by 4". The "fin" of our 12" roller is 12" wide and 1 1/2" deep. The Roller Frame is 12" by 4" and well padded on the bottom. The "fin" is about 1/8" thick (we include felt padding to make it thicker for a more snug fit, if needed). Fit notes: Fin style rollers don't fit mercedes ML300 or 2008-12 honda CRV -rear door opens sideways -see our magnetic style. Ask about our toyota Rav4 version; fin depth is 1 3/8"
Use 8" Fin Roller with some Chevy Suburbans -tail light protrudes at top of door. Now you can Simply roll your kayak onto your vehicle. Check the depth of the roof top - 5th door crack before ordering. The VELCRO style comes with a flat bottom (no fin) and will simply "Velcro" to the flat surface of most vehicles that may have a swing or lift type rear door. Also fits most car rooflines, trunk lids & pickup truck opened tailgates. Industrial grade Velcro is used to adhere this roller while you slide your kayak on  then simply remove the roller. The one piece of Velcro will stay in place on the vehicle for next time. Note: Velcro generally sticks to the vehicle for many years but extra Velcro strips are available for future seasons or other vehicles. Got A Plastic Roof or Plastic Roof Extension? Velcro holds roller securely while loading your kayak. Remove roller after use. 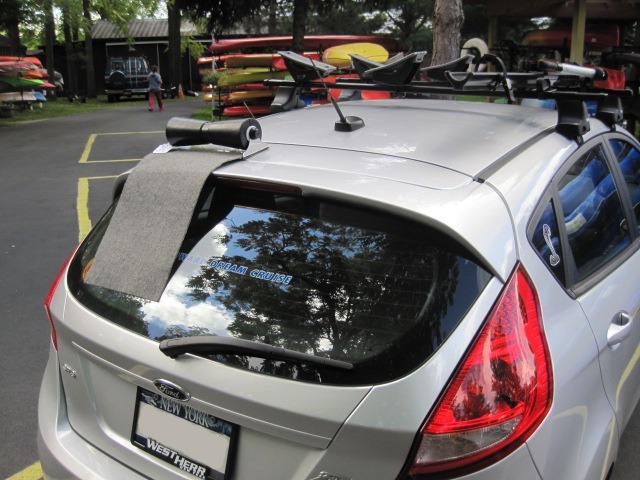 SUV, Minivans and Crossover vehicles; roller sticks to Rear of roof, Roll your kayak forward onto the rack. 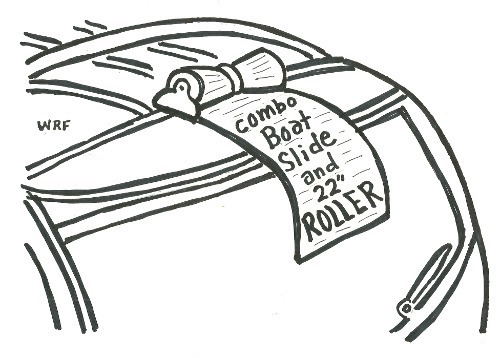 2-door or 4-door sedans; roller sticks to flat TRUNK surface, Roll your kayak forward onto the rack. Pick-UP Trucks; roller sticks to an open flat TAILGATE surface, Roll your kayak forward onto the bed or rack. 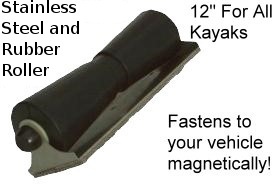 A powerful magnet is used to hold this roller in place while you ROLL your kayak onto your rack  remove roller when done. NOTE: Test your vehicle with a refrigerator magnet to see if the roof is metal or plastic. 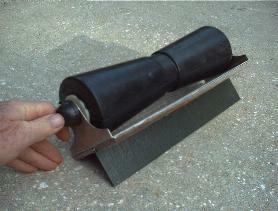 The Magnetic Style SUV Roller requires a metal surface. If your vehicle does not have an appropriate metal surface, use our "Velcro" or "Fin" style rollers. Our Magnet is soft and non-marring, wipe grit off your roof prior to use. Sticks to flat, metal surface. • Load any Kayak easier and faster. • Roller and Mat both prevent scratches. • Fin Model drops in 5th door roof crack. • Available in magnetic or Velcro base. • Stores away in HD storage box. • Stainless Steel frame with rubber roller. Oak Orchard's New Easy Load for BIG kayaks! Remove and stow after loading. Do Not Lift Door with Roller Installed! Don't Scratch Your Car... Load the Easy Way! Perfect for Tandem or Fishing Kayaks with a WIDE bottom. Fin model drops into the 5th door crack in the roof for an EZ Load -just ROLL your kayak onto the rack. The "fin" of our Mega-Roller is 12" wide and 1 1/2" deep. The Roller Frame is 12" by 4" and well padded with felt. The "fin" is about 1/8" thick (we include extra peel-n-stick padding to make it thicker for a more snug fit, if needed). Don't Scratch Your Car... Load the Easy Way! Add a 12" x 19"
to the above Kayak Mega Roller. OR you can order our magnetic version and place behind your present kayak saddles, or on your trunk. A massive 43 1/2 inches wide! Now there's an Easier way to load and unload your Canoe or Kayak. 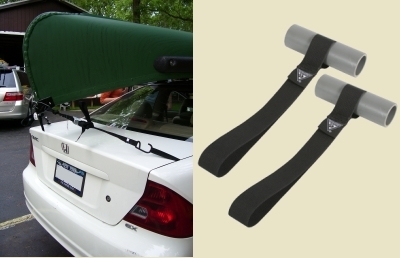 LOAD & UNLOAD YOUR CANOE or KAYAK ONTO YOUR VEHICLE WITH EASE! Manufactured in New York State. Patent Pending. It's Easy, just ROLL your boat onto the RACK. Special padded Stainless Steel frame and Big rubber rollers. A massive 43 1/2 inches wide! Works great for just about any Canoe or Big Heavy Fishing Kayaks. 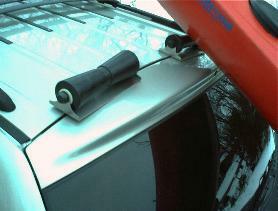 Fin style Roller drops into the 5th door crack in roof of your SUV, MiniVan or Crossover vehicle. You will go paddling more often with such an Easy load for even heavy canoes or kayaks. Insert roller, roll your canoe on or off your vehicle rack, remove roller when done. The "fin" of our Mege-Mega Roller is 23 3/4" wide and 1 1/2" deep. The Roller Frame is 24" by 4" and well padded with felt. If the GAP at the top of your rear lift door is curved you should check that the width of the fin is OK.
You need 1 1/2" depth and 23 3/4" straight width in the GAP of your rear lift door to use this roller. Fits Yakima and Thule racks. Roll your kayak onto your rack, strap it down and away you go! Mount the Rack roller on the rear crossbar and put a kayak saddle (such as our "Gull Wing" saddles) (sold separately) on the front crossbar for an EZ Load. Choose the type of crossbars on your vehicle rack. The first load-assist mount to handle both SUPs and kayaks. The Yakima ShowDown makes loading and unloading heavy kayaks and paddle boards a breeze. The lightweight mount tilts down more than two feet from the roof rack, takes on up to 45% of the boat�s weight, then helps you gently raise it up onto your vehicle. Note: you'll need several inches of cross bar beyond your roof rack's tower to mount ShowDown. Each ShowDown unit has two universal clamps for just about any bar shape; one mounts inside the tower and one outside. Once loaded it securely cradles your boat or boards for the ride. At only 21 lbs. it�s super lightweight but built burly enough to wrangle up to an 80 lb. load. One pair of ShowDown loaders per box. -You will need one pair per kayak. Yakima Mako or Hull Hound saddles fit more kayak hull shapes using an ergonomic form-fitting cradle design. Sold in pairs (one left and one right saddle per box). Box also includes one Hull Strap. One pair of saddles per box. -You will need two pair of saddles per kayak. 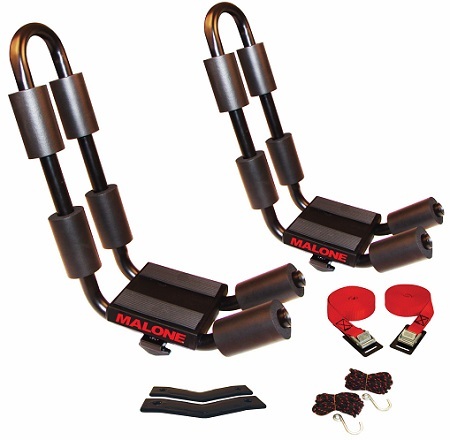 Mako saddles for: Round (Yakima) or Rectangular (Thule) crossbars. Hull Hound saddles for: Factory (oval or wing shaped) rack bars. 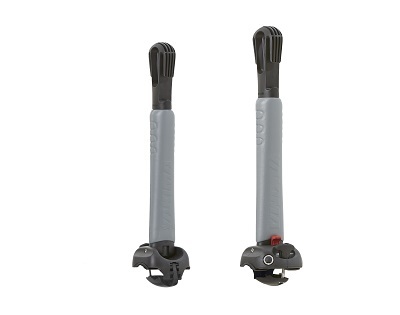 Fits round or flat kayak hull shape thanks to U-Joints rollers that pivot from side -to-side and front-to-rear. Makes loading and unloading a breeze using pivoting rollers. Just get the bow of your kayak up to the rear cross bar of your rack and ROLL it forward! NOTE; set your Hullys far enough apart so the Roller is angled against the kayak to prevent side to side movement. Add the Oak Orchard Mini Roller in-between the rear pair of Hullys for effective Roller action on the wide or the narrowest part of your kayak! Quick and Easy installation onto round (Yakima) or rectangular (Thule) crossbars. Not designed for factory (oval) rack bars. Sold in pairs (one left and one right Hully per box). Box also includes one Hull Strap. One pair of Hullys per box. -You will need two pair of Hullys per kayak. Deckhand Saddles fits more rounded kayak hull shapes using an ergonomic form-fitting cradle. Quick and Easy installation onto just about any roof rack, round or aero (Yakima) or rectangular (Thule) crossbars. Sold in pairs (one left and one right saddle per box). 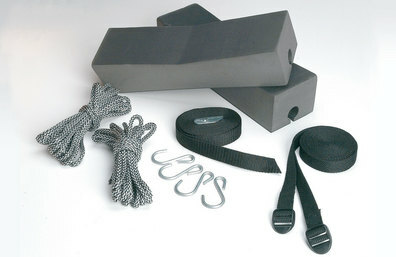 Box also includes one Hull Strap and Bow/Stern Tie-Downs. Locks to roof rack with SKS Lock Cores (sold separately). NOTE; set your Handrolls far enough apart so the Roller is angled against the kayak to prevent side to side movement. Add the Oak Orchard Mini Roller in-between the rear pair of Handrolls for effective Roller action on the wide or the narrowest part of your kayak! Quick and Easy installation onto most roof racks, round or aero (Yakima) or rectangular (Thule) crossbars. Sold in pairs (one left and one right Handroll per box). 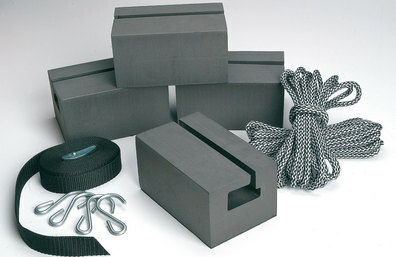 Box also includes one Hull Strap and Bow/Stern Tie-Downs. One pair of Handrolls per box. -You will need two pair of Hullys per kayak. Similar to the EvenKeel but these pads are larger and also articulate so they will better fit your kayak's hull shape. Rear set has integrated Rollers to ease your kayak up onto the rack. Fits all popular kayaks with its contoured surface. Quick and Easy installation onto round (Yakima) AND rectangular (Thule) AND factory rack crossbars with a wing OR oval shape. Includes 2 Hull straps and 2 Bow/Stern straps. Two pair of saddles per box. -You need two pair of saddles per kayak. 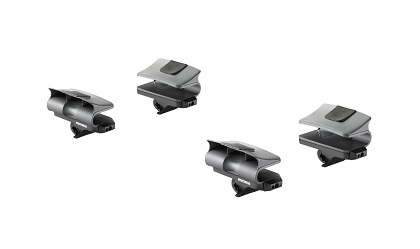 Set of 4 compact plastic saddles. Fits all popular kayaks with its contoured surface. Bow Down is a top-of-car mount which folds down when it's not in use for better aerodynamics, and gives you easier access to the garage. Thanks to the integrated boat ramp, it's painless to load, too. The ginormous knob is easy to twiddle, even if you've got butterfingers. 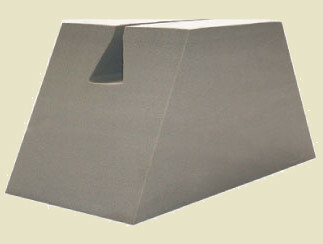 And top-of-the-line HullGuard padding uses EVA foam for improved boat protection. 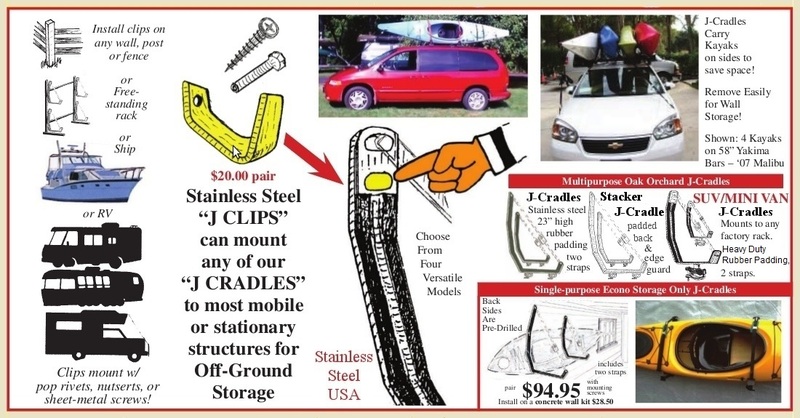 J-Cradle design for carrying a single touring, recreational or whitewater kayak. New SteelCore construction utilizes a steel substrate encased in durable foam padding. Folds down flat when not in use for the ultimate in rooftop clearance. Integrated ramp system assists in loading your boat. Locks to crossbar with SKS locking system (lock cores sold separately). Includes 1 pair of Heavy Duty Straps, with padded buckles and Bow/Stern Tie-Down Straps to complete kayak stability. Fits round, square and most factory crossbars out of the box. The JayLow mounts to either round or square bars or Oval bars and provides a solid ride for your kayak. Folds down when not being used. J-Cradle design uses less crossbar space than saddle designs. Keeps touring, whitewater and recreational kayaks safe & sound. Includes premium padding for ultimate boat protection. The Cheapest way to carry two, three or four Kayaks on round, square and most factory rack crossbars. BigStack folds down when not in use. The BigStack's narrow profile takes up the least amount of rooftop space and carries up to four kayaks on their sides. It's padded to protect your kayak and vehicle. NOTE: Oak Orchard recommends stackers for very small kayaks only, or occasional multi boat transport. Since there is nothing to keep the kayak from sliding side ways or front to back on the crossbars (as there is with our J-Cradles) it is critical that kayaks are tied PROPERLY at rack as well as bow/stern. Stackers require two people to unload/load as one must hold the kayak until it is tied or it will tip over, potentially taking your side mirrors with it on the way to the pavement. New SteelCore construction utilizes a steel substrate encased in durable foam rubber padding. Hullguard pads protect and keep your boat looking brand new. Locks to crossbar with SKS system (SKS lock cores not included). AnchorHead tie-down feature offers improved strap management. 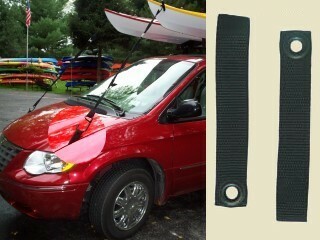 Crossbar pads from Yakima or Oak Orchard are highly recommended to prevent kayak from denting or moving, these are sold separately. One pair of stackers per box. Includes 1 pair of Heavy Duty Straps for one kayak. Extra tie downs for both bow and stern ARE recommended, but NOT included. Quick and Easy installation onto round (Yakima),rectangular (Thule) or factory rack crossbars. Having Trouble Loading That Heavy Kayak or Canoe? 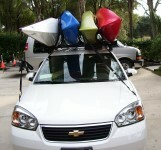 Integrated, load assistance for all types of kayaks and canoes; for use on vehicles with "Yakima" Racks. Telescoping design helps keep the kayak away from the vehicle while loading then retracts out of the way. Provides an extendable and retractable extra length to your front crossbar so you can easily lift the bow of your kayak onto the Boatloader and then lift the stern onto the rack. This is much easier since you are only lifting 1/2 the weight at a time. Great for Sedans and other scenarios where Hully Rollers are less effective than loading from the side. Especially useful on tall vehicles. Works great with our J Cradles. Clever telescoping design stores neatly inside Yakima round bars when you're done loading/un-loading your boat. BOATLOADER EVO fits Yakima Roundbars and Yakima Corebars only. Slide ShowBoat back when Loading. ROLL your canoe or kayak on. Slide forward when ready to drive. This versatile load assist roller makes it painless to get your kayak or canoe on top of the vehicle, even if you're loading multiple boats all by yourself. It slides out to protect the rear of your vehicle when loading. Can also slide side-to-side, if you need to load one craft left and another to the right. To use this product, you'll need some type of crossbars on your vehicle to attach the showboat, and some type of kayak saddle or gunwale brackets to hold your craft. Best when combined with Oak Orchard's Gull Wing Kayak Saddles for the ultimate combination of easy loading and boat security. OK with Yakima Kayak saddles. OK with Gunwale Brackets for canoes. Not good with J-Cradles. With ShowBoat you'll never have to lift more than half your boat's weight, saving your muscles for paddling, not loading. Padded Roller to prevent boat damage. Lockable (with Yakima SKS lock core). 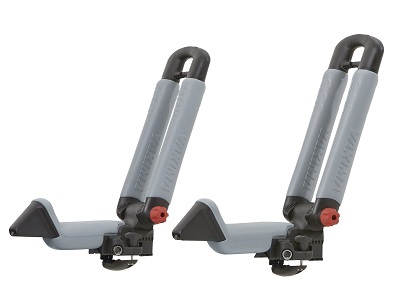 This kit includes a pair of 66" Yakima bars... the ShowBoat Roller slides back and forth on these bars. Carries a canoe by the gunwales in the upside down position. Quick and easy installation on to round (Yakima) crossbars. Adjusts easilly with no tools to the exact width of your canoe. Keeps your canoe from shifting either front-to-back or side-to-side. Sold in a package of Four with Two hull straps. The KeelOver attaches directly to any oval shape factory roof rack for a quick, tool-free assembly, right out of the box. Not only will your canoe arrive to the water safely, but you'll get to spend more time on the water, making for many happy paddlers. Includes: 4 brackets, 2 hull straps and 2 bow-stern straps. Fits Yakima Core bars, Jetstream bars and classic round bars. 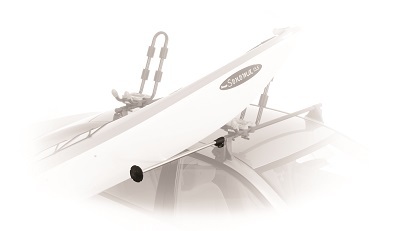 The J-Pro is a traditionally designed J-Cradle kayak carrier built to handle most sit-inside and sit-on-top kayaks. The J-Pro is Malones most affordable yet well built carrier with multiple layers of corrosion resistant coating, padded frames, universal fit mounting hardware and Lifetime Warranty for guaranteed satisfaction. Innovative ratchet pulley quickly secures the bow or the stern of your boat without tying any pesky knots. Just pull the line to tighten, or press the quick release lever to loosen the line. Bow and Stern lines (or straps) are important and recommended by Oak Orchard, Yakima and Thule for ALL kayaks and canoes. reg. $19 each. Sale; $16.99 each. You may add one to your shopping cart and then revise the quantity you wish to order. Shipping cost is the same for any order Qty of the same item. Essential equipment for cartopping any kayaks and canoes. Center spring buckle design is sturdy and quick. The best available. 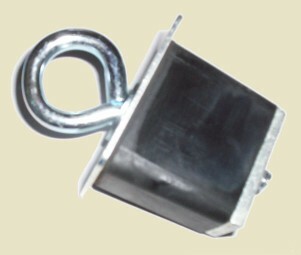 Coated Hardened steel hooks will grab any metal part or metal hole under your vehicle like no other strap or rope can! (not included with any items above) Specify 4.5', 6' or 8' length. with a rounded bumper... straps can go under your car tire! Ouch! A Great idea for any vehicle. A must for vehicles with rounded bumpers OR plastic bumpers that have no metal underneath. These innovative loops install on the quarter panel bolts under the hood to provide a tie-down attachment. Lift hood to find such a removeable metal bolt or metal screw. Put bolt thru hood loop and then re-install the bolt. 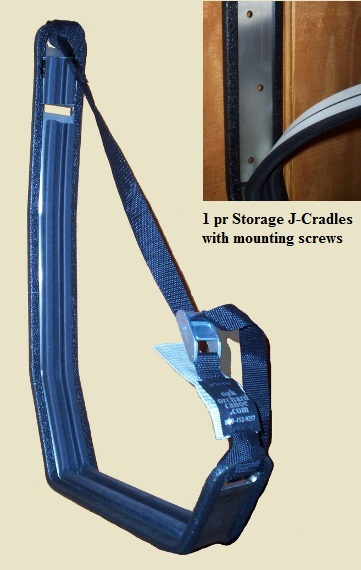 The loop is now secure in place, providing a quick, easy loop to lash your bow/stern tie downs or straps. It's that easy. Hood loops can be folded under the hood when not in use. TIE DOWN? Bow/stern straps sold separately. Available in black. 1" width, 8" length. these will work front and back on almost any vehicle. Quick, easy, effective in any vehicle's Trunk, Hood or Hatch. It's that easy. Trunk loops can be folded under the hood OR removed when not in use. Available in black. 1" width. Insert into stake pocket of your pick up truck and tighten to provide a convenient tie down location. 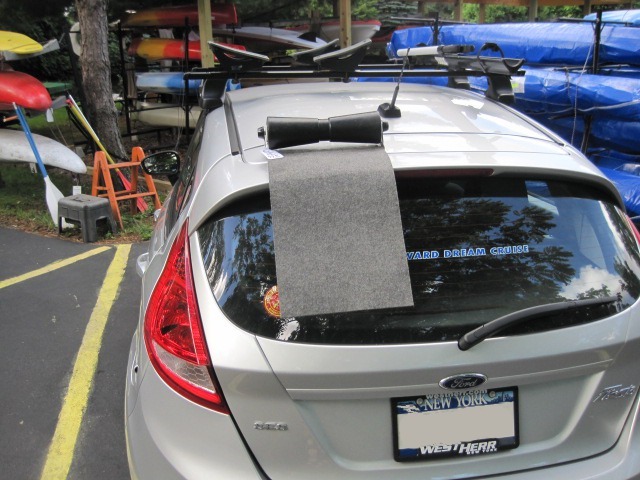 Top Plate: 2 1/2" x 2 1/8"
Old Town's Car top carrier kit for economy kayaks. Includes two basic kayak Foam Cradles, two Bow/Stern lines with hooks and one 13' Over-the-Hull Strap. Foam blocks are 3" tall and 14" long. Our Premium Foam Kayak Saddles are universal; they'll work on vehicles with OR without racks. 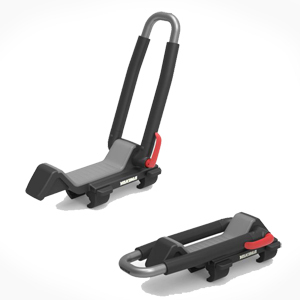 These Saddles can be used on Yakima, Thule racks or on your vehicle's factory cross bars. 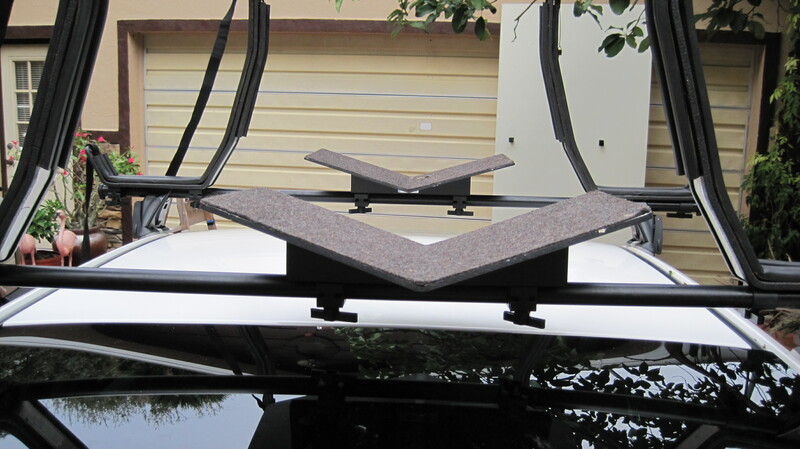 Features our No-Skid anti-slipping bottom for use on vehicles roof without racks. For best results choose the cradle size that is closest to the width of the bottom of your kayak, at that point where the saddles will be positioned. Our Kit comes complete with all you need to carry your kayak on just about any vehicle. Kit includes 2 Premium Foam Kayak Saddles (16" x 4" x 4") TWO 8' Bow Straps, TWO 13' Over-the-Hull Straps and TWO 6' Stern Straps. This kit works better than any other foam saddle kit we've seen! While we would still prefer a Yakima rack, THIS IS THE ONLY FOAM CARTOP KAYAK KIT WE RECOMMEND. Other kits are much less reliable and cheaper only because they have smaller blocks and much fewer straps. Our Premium Foam Kayak Saddles are Universal; they may be placed directly on your vehicle roof due to their no-skid bottom, OR they can clip onto most rack crossbar shapes. If you don't see anything good to tie to on the front or rear of your vehicle you'll want to add Hood Loops and Trunk Loops. For best results choose the saddle size that is closest to the width of the bottom of your kayak, at that point where the saddles will be positioned. Kit includes 2 Premium Foam Kayak Saddles (22" x 4" x 4") TWO 8' Bow Straps, TWO 13' Over-the-Hull Straps and TWO 6' Stern Straps. Our Extra-Wide Premium Foam Saddles are universal; they'll work on vehicles with OR without racks. 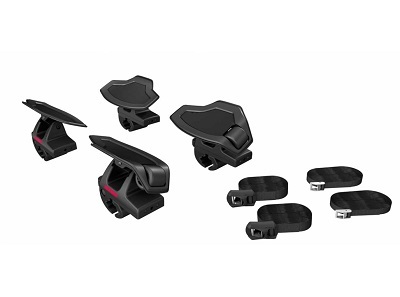 These Saddles can be used on Yakima and Thule racks, OR on your vehicle's factory cross bars. Features our No-Skid anti-slipping bottom for use on right on your vehicle's roof without a rack. For best results choose a saddle size that is closest to the width of the bottom of your craft, at that point where the saddles will be positioned. These work great for any Paddle Board and most of our extra wide Kayaks. 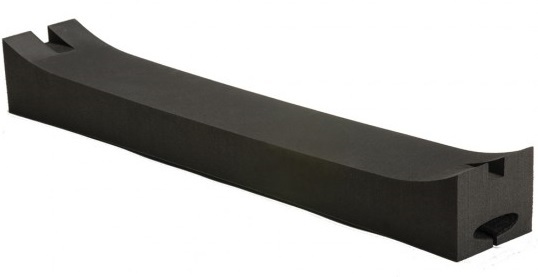 This extra wide, low-profile foam block allows you to stack your SUP Paddle Boards securely. These work great if in-between your boards if you transport OR store your boards on top of each other. .
Our Super Tall Kayak Cradles will work on vehicles with or without racks. The main benefit of a TALLER cradle is to be as high, or higher than the luggage rack or a spoiler. 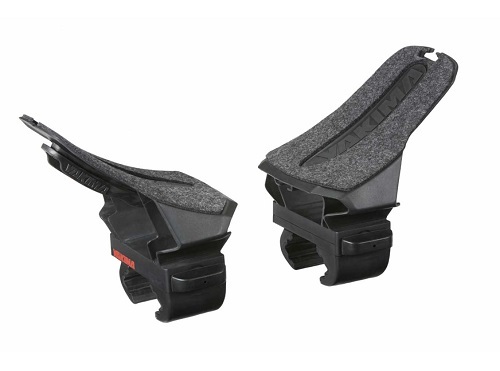 These Cradles Feature our NO-SKID anti-slipping BOTTOM for use directly on your vehicle roof or truck cap. This cradle shape fits the bottom shape of most recreation or touring kayaks. We frequently use a single cradle to support one end of a kayak in situations where both racks are on the same end of the vehicle; making the kayak off center. Or, you can use a pair to support one kayak. 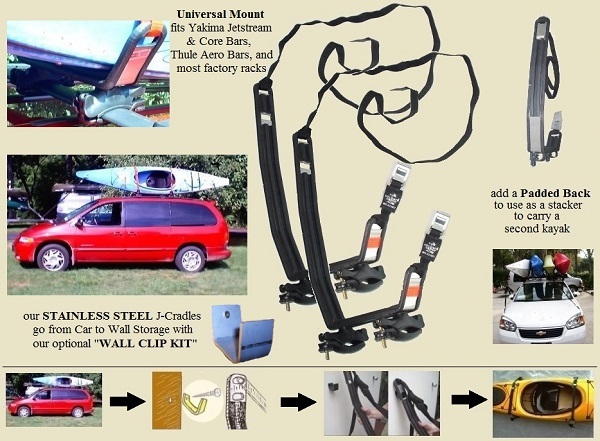 Old Town's car top carrier kit for economy canoes. Includes four basic canoe Foam Blocks, two Bow/Stern lines with bumper hooks and one 13' Over-the-Hull Strap. Foam blocks are 3" tall and 4" long. Our Kit comes complete with all you need to carry your canoe on just about any vehicle. Kit includes 4 of our Premium No-Skid Foam blocks (8" x 4" x 3") TWO 8' Bow Straps, TWO 13' Over-the-Hull Straps and TWO 6' Stern Straps. This kit works better than any other foam block kit we've seen! 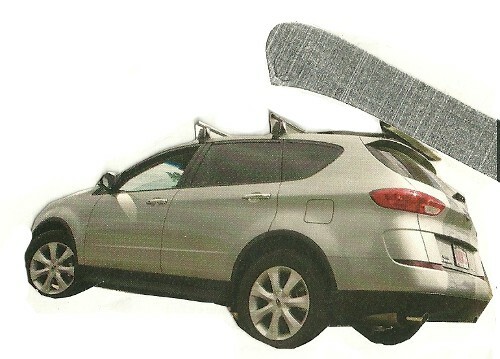 While we would still prefer a Yakima rack, THIS IS THE ONLY FOAM CARTOP CANOE KIT WE RECOMMEND. Other kits are much less reliable and cheaper only because they have smaller blocks and much fewer straps. Some vehicles may need Hood or Trunk Loops in order to have a good tie down point. Simply attach our canoe blocks to the gunwale of your canoe to create an easy, safe and economical transport system for your canoe. Features our No-Skid anti-slipping bottom for scratch free and worry free car topping. 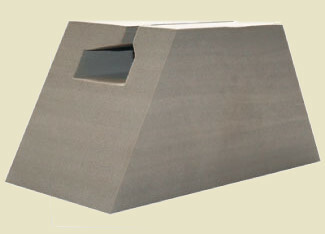 Block dims; 8" x 4" x 3"
This Narrow slot cut is designed to fit all aluminum canoes as well as Bell and Wenonah in fiberglass or Kevlar canoes (aluminum or wood gunwales). Also fits most other canoes with aluminum gunwales but not Bell Royalex models. For best results use with our Over-the-hull and Bow/Stern straps.... Safety First! This Wide slot cut is designed to fit all canoes with vinyl gunwales as well as Bell Royalex models with aluminum gunwales. Fits Wenonah Royalex models with wood or vinyl gunwales. Also fits all Old Town and Mad River models of any gunwale type. The additional height of this canoe block allows you to bypass over your vehicles factory luggage racks. Also works great on vehicles that have No rack, just a plain metal roof. Taller blocks provide maximum versatility since you can position more places along the roof and better support your craft. Features our No-Skid anti-slipping bottom for scratch free and worry free car topping. Tall Block dimensions... 8" long x 4" wide x 5" tall. Good on aluminum, wood, vinyl and most other gunwale types we've seen. 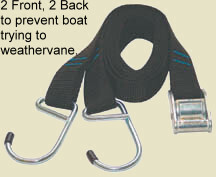 For best results use with our Over-the-hull and Bow/Stern straps.... Safety First! (scroll up a bit higher on this web page).